King 810 come from Flint, Michigan. Not a place were many people would choose to live, it's a city that has topped polls of "most violent cities" for quite a few years and has shockingly high rates of crime including murder. It's a place where since the autommobile industry cut back dramatically on manufacturing in the city, unemployment is very high, and poverty is rife. Why does any of this matter? Well for a start, it's a tough place to grow up and it explains why King 810 are the band they are. The first part of the album is heavy, violent and the vocals are very reminiscent of Slipknot. As you listen to the album though it's clear that it's split into several sections and spoken word sections act as introductions to the next part. Later in the album it's very different to early on though. A superficial listen to the first few tracks will lead to Slipknot comparisons or claims they glorify violence, but the more you listen to the album the more you realise there's far more to it than that. The album is described as a memoir of the life of singer David Gunn. So, the first part of the album is hard and heavy and contains lyrics about violence - in other words, about survival in a city that has been dubbed Murdertown USA. In some ways it would be hard for a band from modern-day Flint to avoid singing about the violence there. "Take it" opens with an intro where David Gunn is heard asking Papa Legba to “open up the gates for him”. Papa Legba is a figure in Voodoo who stands at a spiritual crossroads and controls the gateway to speak to the spirit world. "Take it" is a very different song to say "Killem all" - gone are the hard heavy guitars and the almost shouting vocals, and instead its softly done on acoustic guitar with a plain singing style and with the jangling of keys (one of the items Papa Legba carries in voodoo) in the background. It's got a spiritual feel to it. "Anatomy 1-2" is a spoken word section that is compelling and powerful to listen to - more like poetry or song lyrics than someone just talking. It serves as a break point in the album as does the second talking section later on, so the album splits into three parts. As we go into the second part, we start with "Eyes". Gone are the hard brutal vocals and powerful guitars and instead it's more ballad-like. Not a ballad as such, but still a softer slower song, with lyrics about death and being laid to rest in the earth as well as a line that talking about God says "I'll tell him that I was stupid" as he regrets actions before his death. The final song in this section is "Devil don't cry" which has a sad introspective feel to it. It's played on acoustic guitar with piano and strings used too. As the album comes to a close you have songs such as "Carve my name" where hs sings that his mum asked him to stop singing about killing. The album comes to an end with "Write about us" and "state of nature", which are both slow songs. They are more spoken than sung although there are singing parts here too. There's certainly plenty to think about as you listen. 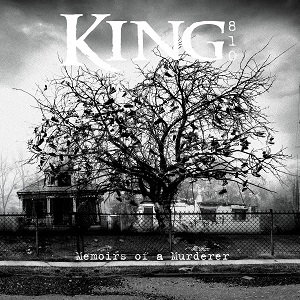 Before I listened to the album I hadn't really taken much notice of King 810 other than noticing that they seem to be getting a lot of attention at the moment. I have to say I'm really glad I decided to listen to and review the album - it's a superb piece of work. On the superficial level, the heavier songs are going to appeal to a lot of fans of bands like Slipknot, but it's when you listen to the lyrics and really listen to the album as a whole rather than hearing the oddd song or two on youtube that you start to get a lot more out of it. It's more intelligent and thoughtful than you might realise if you just hear songs like "Killem all" by themselves.